The OrthoARMOR Wrist Support is designed for carpal tunnel, injuries to the wrist / hand and post-cast healing. This brace is made of a rigid plastic support contoured to the hand and wrist with adjustable aluminum palmar stay. the brace is nice an comfy. the plastic stabilizer is adequate and was my worry going into it but it works just fine and supportive. simple brace sport and comfort is actually one of the better ones. there is one draw back. The Velcro strap attaches a little to close on the other side. while the slack can be trimmed past the attachment, after it is trimmed one is basically forced to re-lace the straps each time it is removed and put back on. Brace is very comfortable. 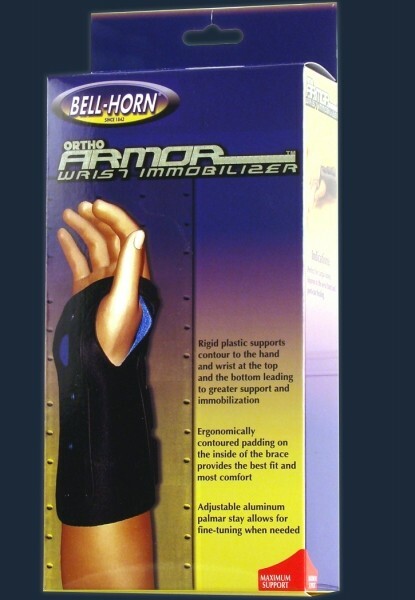 It does immobilize the wrist. It is like wearing a very comfortable cast with the advantage of being able to take it off any time you want to. I liked it so much I bought a second one. Pros: Comfortable. Holds wrist in place.